I love zucchini. And I loooove stuffed zucchini. I mean could there really be a more fulfilling quest to make a nutrient-laden homely vegetable into a calorie-laden beauty queen? No question, this is definitely the ultimate way to stuff the little squashies. Tender roasted potatoes, creamy cheese, flavorful garlic and onions, light and fresh tomatoes, and fragrant basil all combine to make the filling unimaginably tasty. Seriously, these are so delicious that I nearly forewent dessert and had another of these instead. Nearly. Adjust one oven rack to upper-middle position and second oven rack to lowest position, then place a rimmed baking sheet on each rack and heat oven to 400 degrees. Meanwhile, halve each zucchini lengthwise. With a small spoon, scoop out the seeds and most of the flesh so that the walls of the zucchini are about 1/4-inch thick all the way around. Season the cut sides of the zucchini with salt and pepper and brush them lightly with 2 tablespoons of the oil. Set the zucchini halves cut-side down on the hot baking sheet that has been preheating on the lower rack. Meanwhile, toss the potatoes with 1 tablespoon of the olive oil, salt, and pepper, to taste, in a small bowl and spread in a single layer on the hot baking sheet that has been preheating on the upper rack. Roast the zucchini until slightly softened and skins are slightly wrinkled, about 10 minutes while simultaneously roasting the potatoes until they are tender and lightly browned, 12 to 14 minutes. When the zucchini has finished baking, remove it from the oven and using tongs, flip the zucchini halves over on the baking sheet and set aside. While the zucchini and potatoes are roasting, heat the remaining tablespoon oil in a 12-inch skillet over medium heat until shimmering, about 2 minutes. Add the onion and cook, stirring occasionally, until softened and beginning to brown, about 10 minutes. Stir in the garlic and cook until fragrant, about 30 seconds. Add the tomatoes and cooked potatoes; cook, stirring occasionally, until heated through, about 3 minutes. Off the heat, stir in the basil, 1/2 cup cheese, and salt and pepper to taste. 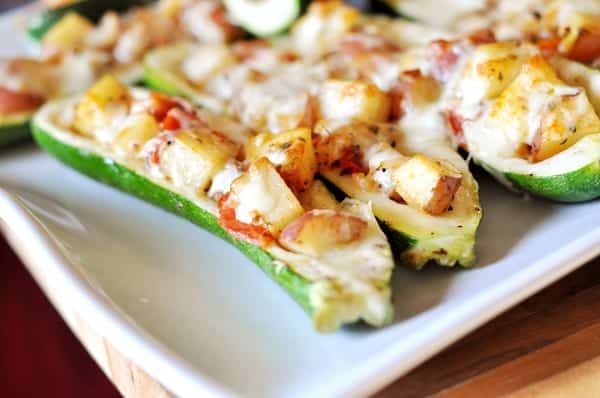 Divide filling evenly among the zucchini halves on the baking sheet, spooning about 1/2 cup into each, and packing it lightly; sprinkle with remaining cheese. Return the baking sheet to the oven, this time to the upper rack, and bake the zucchini until heated through and cheese is spotty brown, about 6 minutes. Serve immediately. I ate this at a friends house and knew it was going to become a staple in my own house. I wasn’t surprised at all when she told me it was one of Mel’s recipes! I’ve since made the dish twice myself. My sister and I ate it with eggs for breakfast, and chicken for dinner! We love it! I have a gastric band and I recommend this recipe all the time – it’s perfect = tasty, flavorful, filling, easy side for carnivores, just easy! I love it! Thank you so much! I made this over a year ago. It was amazing. Seriously. A lot of work but so so yummy. Loved them. Never had stuffed zucchini before so I only made half a recipe. I wish I would have made the full amount. They were delicious. I served it with stuffed chicken breast, but I preferred the zucchini over the chicken I made. My sister and mother in law just brought me a bunch of zucchini and squash. I am writing down all the ingredients I need from all your veggie recipes! So excited to try this one! Youre a lifesaver! Thanks so much for sharing this! We made it last night, and although this took a little more work than our normal dinners, it really was worth it to see my non-veggie-loving husband chow down on this happily. I’m eating the leftovers for lunch today – still delicious!! I made these because I have lots of squash and lots of red potatoes right now, and my husband liked them so much, he asked me to make them again the next night! We didn’t have anymore fresh tomatoes, so I used canned. Not nearly as good, but still yummy. I must say I am now converted to the combination of gooey cheese/fresh basil/fresh tomatoes! It is amazing! Hi Mel, I make your recipes all the time – I’m totally a closet fan. =) I’m a homecook that tries very hard to incorporate lots of veggies and fruits into my cooking (I have 3 little boys who I want to love their veggies!) and I find a lot of your ideas and tips very helpful. Thanks for all your fabulous recipes, you make my life SO SO easy!! You are awesome! wow, that looks so good, I’d love to do this as a mission meal for the homeless if I could get my hands on enough zucchini. I freezer cook for the homeless over at my blog and I just put a heads up for extra garden veggies locals may have. You have such pretty photos with foods that pop. I like to visit for inspiration! Is there a way to make these a few hour ahead and keep them warm until serving? Just wondered if having them sit in a crock pot for a couple hours would turn out in a disaster!? They sound great and I would love to try to make for a BBQ this weekend. Aimee – unfortunately, I think the slow cooker would turn these babies ultra-mushy. If you had the flexibility, I would assemble the zucchini and then refrigerate. About 1/2 hour before serving, pop them under the broiler or in a preheated oven (according to the recipe) and cook them through until warm. This looks amazing! My zucchini plant has stopped producing, but I may have to stop by the Farmer’s Market this weekend to pick some up so I can try this. I’m loving the whole idea! So I absolutely adore this recipe. So delicious. However, when I made it for family a month or two ago, I noticed that several people scooped out the yummy, cheesy innards and left behind the zucchini shells. So the next time I made it, I just skipped the zucchini and did a sort of potato bake. Those that had scooped out the middle months before raved and asked where the recipe came from. Little did they know, they’d already had it! Anyhow, for those who don’t prefer zucchini (and I think you’re nuts! 🙂 ), this makes an excellent baked potato dish as well! Shauntel – I never would have thought to use the filling on this recipe for a separate side dish but wow, I bet it is excellent. Thanks for the tip! I just had to tell you about my first foray into stuffed zucchini: AMAZING! I served them up for some house guests along with the honey roast chicken and wow, it was a memorable meal. I didn’t have jack cheese on hand, so instead I used little marinated mozzarella balls, and just stirred that into mixture, and it was divine. Using the zucchini and tomatoes from our garden made this extra fun and tasty. This will be an oft-made summer dish. Thank you! Reyna – I’m thrilled you liked this dish. I bet fresh mozzarella would be amazing. By the way, your Bavarian Apple Torte is in the oven as we speak. Can’t wait to devour a piece or four. Thanks for sharing. I made these on the spur of the moment tonight and they were amazing! I love this recipe. We tried it the way you stated and it was a hit. We tried it again last night and used squash instead (since this was all we had in the house) and added bacon bits to it. You could make so many different little variations and it will still turn out awesome. This is one item that will be a frequent at our dinner table. Kelly – I love the idea of using squash, thanks for giving us your variations! Made these tonight, and modified for my kid w/ PKU who can’t have cheese. They were a hit with EVERYONE! Thanks! Thanks, Heidi! Glad they were a crowd-pleaser. I made this tonight and it was really very good! Super filling and yummy for summer! Thanks, Shanna! I saw your post on this – your photo was fabulous! Oh Mel, after 2 weeks of vacation and eating out I am salivating over everything you have posted, not that that’s anything new. Now I’m off to make the oatmeal coconut cookies–two of my favorite combinations! I made this today as an appetizer/lunch while we watched the World Cup. My husband suggested I add scrambled eggs to the filling next time, too. Breakfast burrito in a zucchini? I love recipes that use lots of veggies. Thanks! Smirking – I think your husband is brilliant – the idea to add scrambled eggs would be delicious! Oh Yum!! 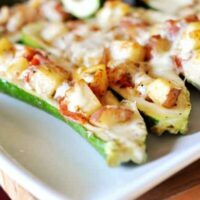 I have abunch of zuchini and can not wait to make these! Gardens are fully loaded right now here! This will go on the menu for next week for sure! Thanks Mel! And these look delish. We’re going to have zukes coming out of our ears, so we’ll give these a try this summer. This looks so amazing, I can’t wait to try it! Hopefully I’ll be picking zucchini in the garden soon! Thank you for all the inspirational recipes and lovely food photos-I gave you a “Happy 101” award over on my little blog this week! Yummy! What a great recipe! Can’t wait to try it. We just started harvesting some zucchini from our garden. I can’t wait to try this! Thanks for sharing the recipe! Wow I love this post and your recipe. Zucchini is one of my favorite vegetables and I have actually never stuffed it before. Thanks to your recipe I think I’ll have to try something like this soon! Love the photos you have here too, they are really beautiful. What a beautiful photo. I’d like to eat about 12 of these right now! That melted cheese is just so…. I LOVE zucchini. If I had to pick one veggie to eat for the rest of my life zuch would be it. 😉 Thanks for the recipe! Do you live anywhere near northern California? If so, please come to my garden. We are over-run with zucchini. Take them all! 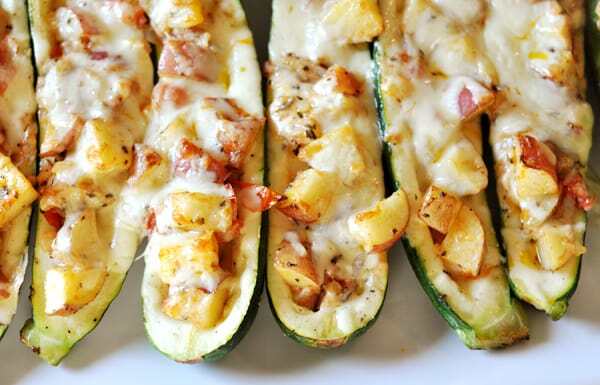 These are gorgeous stuffed zucchini. I can’t wait to try them. That is loaded! It sounds awesome. Would love to try this one for a party!